The first Jewish citizens of the Sumter community came from Charleston about 1815. These early settlers were of Sephardic background and many had fled persecution in Spain. As oppression spread in Germany, Poland, and then Russia, immigrants from these countries also settled in South Carolina and the Sumter Community. Two early organizations preceded the formation of the Jewish congregation in Sumter: The Hebrew Cemetery Society was formed about the time that land for the Jewish Cemetery was purchased in 1874. The Sumter Hebrew Benevolent Society was organized before April, 1881, according to its recorded minutes. These minutes named twenty-four men as being present and reflect the formation of a committee to unite these two societies. At a meeting two weeks later, the two groups agreed to merge. Thirty-one dues-paying members were recorded by name in these later minutes. 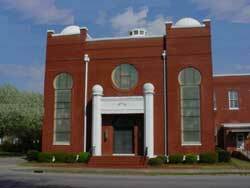 In April, 1895, the official merger occurred between The Sumter Hebrew Benevolent Society and The Hebrew Cemetery Society, with the surviving organization becoming The Sumter Society of Israelites, the official name of present-day Congregation Sinai. By 1895, the Jewish Congregation had become well organized. Regular meetings were being held and a Sunday School was operating. Charitable projects were undertaken and the cemetery was organized and in use. Rabbi E.S. 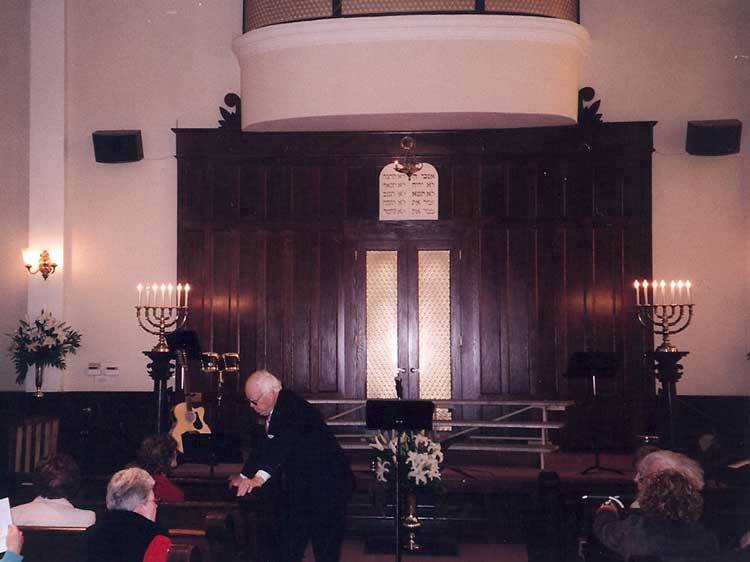 Levy from Augusta, Georgia and Rabbi David Levy from Charleston served the Congregation at regular intervals. A first confirmation class had been trained and was confirmed in Charleston in June, 1891. The support of these two rabbis helped mold and strengthen the Sumter Jewish community into a congregation. Rabbi Jacob Klein came to Sumter about 1904 and served as the first resident rabbi. The first Synagogue was a wooden structure, built on the site of the present building. It was replaced by a brick building, dedicated in the spring of 1913. Several major additions to the Synagogue were made over the years. A substantial remodeling of the sanctuary was celebrated in a rededication service in 1969. In addition to regular services and the Sunday School, the Congregation has been well served by both an active Sisterhood and a Men’s Club. In 2007, Temple Sinai donated all of their archives to the College of Charleston Jewish Heritage Collection. This act ensures the archives will be preserved for all to research. On May 4, 2008 the Jewish Historical Society of South Carolina held their Spring Meeting in Sumter to acknowledge the receipt of the archives and to announce that an Historical Marker will be erected in front of the sanctuary. The Temple’s Sanctuary is blessed with eleven extraordinarily beautiful stained glass windows. There is a set of ten matched windows, each about five feet wide and twenty feet tall, placed around the three exterior walls, and a single one high up in the back wall, between two of the larger windows. The windows depict Biblical scenes from the Old Testament. The picture in each window is accompanied by a quotation from its respective book of the Bible. Temple benefactors dedicated the various windows to the memory of famiy members. The design of the windows is late Victorian style, with interlacing patterns at the side borers. Their large circular tops give thema mid-eastern look. The glass is handmade with thick rolling folds used to create deep colors and a dimensional effect and causing the glass to be known as “Drapery” glass. The brilliant blues, as in Rebecca’s dress, have colbalt added, and gold was added to the reds to make the colors more vibrant. The windows are best viewed in the afternoon sumlight, but are beautiful any time of day. Large color prints of the windows, suitable for framing or mounting are avaiable in the Temple office. Pictures of the Stained Glass Windows can be seen on this site at the Sumter Heritage Days and Sumter 2008 Meeting. The list of the Sumter Cemetery Burials can be searched by clicking here. On May 22, 2009, a South Carolina State Historical Marker was erected by The Jewish Historical Socieety of South Carolina. Inscriptions on the marker can be read on the Sumter Historical Marker site. Click here to see Memorial Plaque list and pictures of plaques.